North Starn State; The Gopher State; Agate State; State o Hockey. Minnesota ( i/ˌmɪnᵻˈsoʊtə/; locally [ˌmɪnəˈso̞ɾɐ]) is a state in the midwastren an northren regions o the Unitit States. 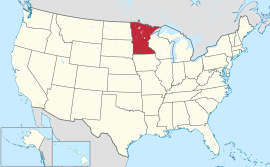 Minnesota wis admittit as the 32nt U.S. state on Mey 11, 1858, creautit frae the eastren hauf o the Minnesota Territory. The state haes a lairge nummer o lochs, an is kent bi the slogan "Land of 10,000 Lakes". Its offeecial motto is L'Étoile du Nord (French: Starn o the North). Minnesota is the 12t lairgest in aurie an the 22nt maist populous o the U.S. states; nearly 60 percent o its residents live in the Minneapolis–Saint Paul metropolitan aurie (kent as the "Twin Cities"), the centre o transportation, business, industrie, eddication, an govrenment an hame tae an internaitionally kent airts commonty. The remainder o the state consists o westren prairies nou gien ower tae intensive agricultur; deciduous forests in the sootheast, nou pairtially cleared, fermed an settled; an the less populatit North Woods, uised for minin, forestry, an recreaution. Minnesota is kent for its progressive poleetical orientation an its heich rate o ceevic pairteecipation an voter turnoot. Til; European settlement, Minnesota wis inhabitit bi the Dakota an Ojibwe/Anishinaabe. In the 19t an early 20t centuries, a lairge nummer o European settlers entered the state that haed mainly emigratit frae Scandinavie an Germany. The state remeens the day a centre o Scandinavian American an German American cultur. In recent decades, immigration frae Asie, the Horn o Africae, the Middle East an Laitin Americae haes braidened its historic demografic an cultural composeetion. Minnesota's staundart o leevin index is amang the heichest in the Unitit States, an the state is an aa amang the best-eddicatit an walthiest in the naition. ↑ 4.0 4.1 Elevation adjuistit tae North American Vertical Datum o 1988. This page wis last eeditit on 4 Dizember 2017, at 04:51.